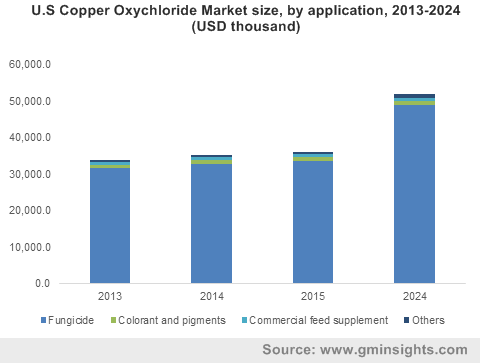 Copper Oxychloride Market size generated revenues over USD 230 million in 2015 and is forecast to witness growth more than 4% between 2016 and 2024. Global population rose from approximately 6.89 billion in 2010 to over 7 billion in 2015, while the global arable land area expanded from over 1.37 billion hectares in 2010 to more than 1.42 billion hectares in 2014. Which signifies that the global population increased by 4.9% compared to the 3.4% growth in the global arable land area during the period. This difference between the population growth rate and arable land area is a cause of concern. Inadequate arable land has put pressure on farmers to increase their yield. According to the World Bank, farmers may have to increase their yield by 50% per hectare by 2050. Significant increase in yield is possible through the agrochemicals usage such as fungicides. Thus, the copper oxychloride market size is anticipated to expand at a rapid pace and is further complemented by governments supports towards such agrochemicals. Fruits and vegetables production has increased steadily due to the improved consumer eating habits and rising awareness towards healthy food. These are rich in essential nutrients such as vitamins, minerals and roughage. Additionally, global food & vegetables production was roughly around 2 billion tons in 2015 and is projected to surpass 2.35 billion by 2024. Fruits and vegetables constitute major share of the global consumption of fungicides. More than one-third of the global fungicides produced is used in fruits and vegetables, driving copper oxychloride market size over the forecast timeframe. Numerous crop protection products including colorants and pigments, fungicides, additional feed supplement and pyrotechnics are available in the industry which may negatively hamper oxychloride market size by 2024. Also, the excessive copper oxychloride usage has resulted in the accumulation of copper in the topsoil, which may adversely affect the surrounding environment. DuPont’s Kocide Blue Xtra has become more popular than copper oxychloride, which contains bioavailable copper for disease control and acts as a product substitute available in the industry. Most farmers are unaware of the numerous selective and non-selective fungicides that are available, especially in the BRIC nations. However, industry participants along with the government bodies and cooperatives are adopting various measures to improve awareness among farmers which will create new for copper oxychloride market size growth avenues. Copper oxychloride market share for fungicides is forecast to experience highest growth at over 4%. It is used as agricultural fungicide to manufacture of crop protection chemicals. These are highly efficient fungicide for potatoes, tomatoes, stone fruit, grapes, celery, citrus, carnations, avocados and coffee. Colorants & pigments generated revenue more than 5 million in 2015. Copper oxychloride is used to manufacture colorants and pigments for ceramics and glass. As a coloring agent, it is used in wall paintings, illuminations and manuscripts. North America, particularly led by the U.S. oxychloride market size was valued at over USD 55 million in 2015. Increasing food demand in the U.S. will boost agrochemicals use for crop production. This ultimately should increase copper oxychloride market size over the forecast timeframe. Asia Pacific is projected to expand at over 4% CAGR by 2024. The regional growth is mainly propelled by improving consumer food habits, resulting in escalating fruits & vegetables demand, along with rapidly decreasing arable land due to robust industrialization, mainly in China and India. Oxychloride market share is moderately consolidated with top three manufacturers accounting for around half of the global share in 2015. Key industry players are IQV, Isagro S.p.A. and Albaugh, LLC. Furthermore, key players are entering in long term agreement with raw material manufacturers which strengthens their dominance. Other key participants functioning in the business are Biota Agro Solutions Private Limited, Spiess-Urania, Killicks Pharma, Syngenta, Manica S.p.A., Vimal Crop Care Pvt. Ltd., and Greenriver Industry Co., Ltd. Moderate integration level exists in the copper oxychloride market. Companies such as Isagro S.p.A. and IQV do not produce raw materials and depend on supply agreements with raw material manufacturers. Also, large number of medium scale manufacturers are based in Asia Pacific, particularly in China and India, which makes these countries account for the largest share of the copper oxychloride market in Asia Pacific in terms of demand. Copper oxychloride market is mainly propelled from the agriculture industry for its use as fungicide on several crop plants such as tea, rubber, coffee, grape, orange, cotton and cardamom. Fruits & vegetable crops are the chief fungicides consumers. Various generic and specific fungicides are developed to find applications in fruits and vegetable crops. It is also used in commercial feed supplements, as copper is the important minerals, which are essential elements in various enzymes that support metabolic functions in most organisms. These are used in pyrotechnics to make blue color. It has been used in pyrotechnics in the past, owing to the low cost of the product as compared to other copper. In addition, it is also used in colorants and pigments application for ceramics & glasses and is also used as chlorination in organic synthesis and an oxidation catalyst. Value chain of the copper oxychloride market comprises raw materials and their suppliers, manufacturers, distribution channels, applications, and end-use industries. The product is prepared through numerous methods including oxidation of Cu(I)Cl in brine solution or the micronutrients process with cuprous oxide or copper as raw material. Copper oxychloride is prepared by reacting cupric chloride in solution with cupric hydroxide. Copper is abundantly available in the market. Companies that produce copper include Codelco, Glencore, and BHP Billiton. Codelco is the largest producer and supplier of the copper metal, while Kemira supplies hydrochloric acid to various industries.